This Yazoo LP album features a beautiful R. Crumb cover along with a great sample of Cliff Edwards recordings of the 1920's. Also included are the two infamous "party" recordings of 1936. 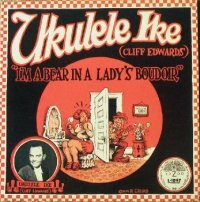 This album is a must for the Cliff Edwards collector. Note in the RealAudio samples below the "I'm Going To Give It To Mary With Love" is a full version of the song.